Today’s recipe is the creation of a very talented friend of mine, Chef Robin White. I met Robin when she was living in Sonoma County and we share a love of California wine country living, using fresh organic ingredients, and creating new recipes in the kitchen whenever possible. Robin grew up in New England and there are times when she craves the foods of her childhood. One of her favorites is corn chowder, but she is living in America’s heartland where serving a bowl of steaming hot soup is something that is only contemplated in the cooler months. But what if you took the flavors and ingredients and turned them into something that can be served cool or at room temperature? Robin is a very talented chef and leave it to her to create a whole new way to appreciate the bounty of summer. This salad has all the flavors of corn and potato chowder soup, kicked up with fresh chile peppers and transformed into a summertime side dish or vegetarian main course. This would make a terrific lunch entree or serve it alongside any grilled meats or poultry. Today at The Food Network’s #SummerFest we are celebrating peppers. These run the gamut from mild bell peppers to screaming hot habaneros, ghost or birds-eye chiles. The beauty of peppers is that you get to choose your heat level. You can mix and match a variety to get the flavor and heat you and your family love. Some people don’t use peppers because they think they don’t like “spicy” foods. What they don’t realize is that they can enjoy the flavors without the heat by using a different kind of pepper. When I went shopping for the ingredients for today’s recipe, there were some absolutely gorgeous baby Cubanelle peppers at the farmer’s market so I grabbed a few of them. My father-in-law grows poblano peppers and had some extras this week, so a couple of those went in as well. I love the rich flavor of these mild peppers and they blend beautifully with the Cubanelles. If you don’t eat bacon or want to make this vegetarian or vegan, you can leave out the bacon and use all olive oil instead. Because you won’t have the salty bacon fat in the final dish, you will also want to increase the amount of added salt to your taste. One of the things I love the most about being part of the Food Network’s seasonal “fests” is that we are given an ingredient and can do anything we want to with that ingredient. It never fails to amaze me when I look at the wide array of recipes that we all come up with week after week. There is some serious talent here and I applaud all of the other bloggers’ creativity! Make sure you check out all the recipes below and follow our beautiful Pinterest page! Have fun with today’s salad and just imagine that it is cold and snowy outside. Maybe you’ll have a little relief from the heat and humidity! This may be a new family favorite for us, how about you? My homegrown tomatoes got added for a little more color and flavor! If you like more spicy heat, you can include a jalapeno pepper in addition to the milder peppers. Just discard the stem and seeds before mincing finely. When you are cutting the kernels off the corncobs, they wobble and the kernels fly all over your kitchen. But there is an easier and safer way to do the job. All you need to do is create a flat surface. Husk and clean the cobs. Snap them in half and stand one half on the flat end. Use a sharp knife and cut down, keeping the blade nearly flat against the cob, trimming the kernels off without cutting into the tough cob. Put the potatoes in a large pot, cover with cold water and add salt. Bring to a boil and cook for 20 to 25 minutes or until fork tender. Drain well and let cool for 10 minutes or until cool enough to handle. Cut the potatoes into bite-sized cubes and place in a large mixing bowl. While the potatoes are cooking, cook the bacon until crisp. Transfer to a paper towel-lined plate and reserve the drippings. When cool, crumble the bacon and set aside. In a large skillet over medium-high heat, place 2 tbsp of the bacon fat and 2 tbsp of the oil. When the oil is shimmering, add the onion and poblano chilies, reduce the heat to medium and cook for 5 minutes, stirring regularly. Add the corn kernels and cook for another 2 to 3 minutes. In a small bowl combine the vinegar, water, honey, 2 tbsp bacon drippings, 2 tbsp olive oil, and hot sauce. Whisk to combine and add to the skillet with the vegetables. Bring to a boil and cook 1 minute. Remove from the heat. Stir the butter into the vegetables, taste and adjust the seasonings with additional salt or pepper if needed. Add the vegetables to the potatoes and add in the crumbled bacon. Toss until combined. 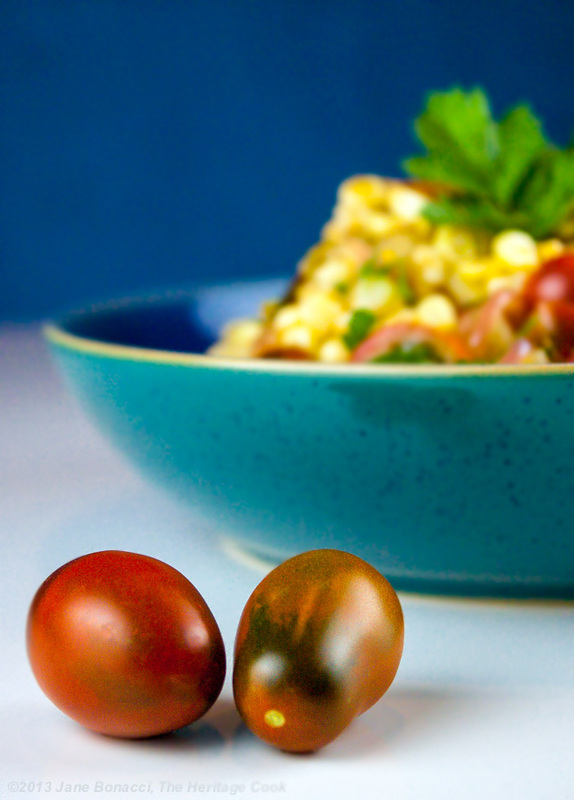 Transfer to a serving bowl and garnish with the tomatoes and chopped cilantro. Serve warm or at room temperature. Store, covered, in the refrigerator. Thank you Diane – I know you will love this salad! It is perfect any time of the year, but especially now with the fresh corn at the market!! What a fun salad Jane – packed with flavors and textures, my favorite kind of salad! Thanks Jeanette! Such a fun idea and really delicious!